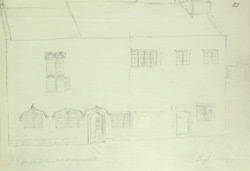 An outline sketch in pencil of the Old Town Hall in Weymouth in Dorset. This building dates from at least the 17th century, though some historians have dated parts of it even earlier. The bell turret is actually dated 1633, and bears the initials 'R.P.' It is reputed to have come from the old church at nearby Radipole.